The world has square roots invites you to discover how simple scientific ideas are applied both in daily life and in the lives of researchers and experts on the cutting edge in every field. Each chapter has two sections. The first looks at a simple idea and reveals its applications in everyday life. How do sound waves travel, and how can you use them to soundproof yourself from your neighbours? Given how heat is transmitted, which cooking pot will be most efficient? How is it that an airplane holding more than 300 people isn't smellier? Through interviews with researchers and experts, the second section examines how the idea can be explained from a scientific and technological point of view. How do drugs travel through the human body? How was the neutrino discovered? How is a piece of evidence analyzed? How could a simple sensor save African elephants from poaching? After finishing The world has square roots, you'll look at scientific ideas from a new perspective: not just as formulas to learn by heart, but as keys to the big (and small) questions of life! Scilabus, the YouTube channel created by the author, has more than 100,000 subscribers and over 3 million views. It's the YouTube channel devoted to pure sciences and produced by a woman with the most subscribers in the French-speaking world. Scilabus has over 70 on-line science videos.? 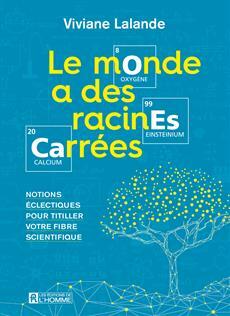 The author succeeds in making us understand and appreciate the scientific ideas surrounding us in our daily lives.? A book based on the pleasure of learning, knowing and understanding.? The book's tone is very enjoyable: lively, amusing, colourful.